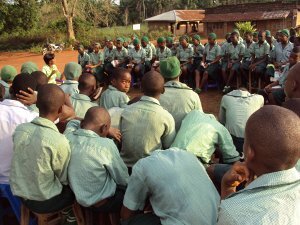 The Children of Hope project (CH) was a PEPFAR funded project in Nigeria which was implemented by the European Cooperative for Rural Development (EUCORD), an international NGO based in Brussels, Belgium in equal partnership with an indigenous partner in Nigeria called the Widows Empowerment Organization (WEWE). RWF started its collaboration with the CH project in October 2009 when the official contractual agreement was signed between RWF and EUCORD/WEWE as a subgrantee to implement projects in nine communities in Imo and Abia states in Nigeria. RWF's main target during the project life with CH included providing nutritional support to 1,053 OVCs 0-17, providing 351 caregivers with income generating activities and in-kind grant; sensitizing 789 individuals under the abstinence and be careful messaging as well as providing training to 39 peer educators in Imo and Abia States. The contract with CH ended in November 2011.